A black and white negative of the All Saints' Anglican Young People's Association (AYPA) on May 11, 1939. In this view an unidentified man is standing wearing a formal robe and holding a cigarette. 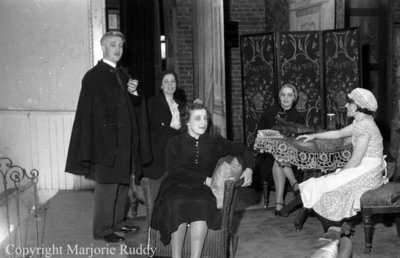 Four unidentified women in different costumes are sitting on chairs scattered on the stage. All Saints AYPA, May 11, 1939, Marjorie Ruddy. Whitby Archives A2013_040_1020B.